I just blabbed to my BFF’s crush that I liked him right before she was about to ask him to the school dance. And now, I feel like such a TRAITOR! What should I do? Okay, this is not good. But I want to thank you for being honest about what you did. A lot of people write me about terrible things other people have done to them (which is fine, since people need advice on that). But, people don’t write much to admit the terrible things they’ve done to other people unless they’re SUPER BRAVE. So you’re super brave, because you know you did something crummy and you’re not afraid to admit it. So, um…I going to be really honest with you too. I’m afraid that what you just did could really upset your BFF. I’m not trying to make you feel worse, I just really want you to sort things out with her before it hurts your friendship! First, you HAVE to make things right with your BFF. If she doesn’t already know what you did, you need to come clean. Please don’t try to cover things up. She’ll find out eventually and it’ll be WAY worse if you tried to lie. 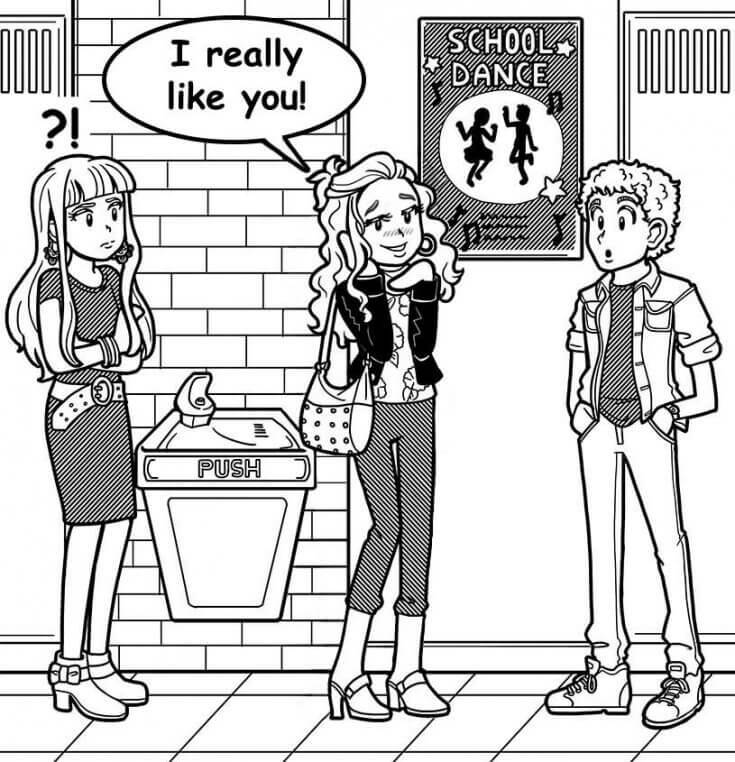 You need to admit how uncool it was to tell her crush you liked him before she could ask him to the dance. Then, just say you’re sorry. Please do not make any excuses. That’s important. You were wrong and you have to admit it fully, or she may not trust your apology. Second, ask her if there’s anything you can do to make things right with her. Now, there is a slight chance that she might not know how. Or, she might forgive you right away. She might even need some time and space to be upset about the whole thing, but fingers crossed that this won’t happen! You have to respect however she responds, because of what you did. But the good news is that if SHE ever messes up (because we all do sometimes), she will remember how you handled things and hopefully she’ll handle things the same way…willing to apologize and make up for it. Okay, so about the guy. Sounds like you’re kind of crushing on him too, right? But, you knew your BFF liked him first? Ultimately, it’s up to him how he wants to handle this, but if he still wants to go to the dance with your BFF, please don’t feel bad. Crushes don’t last forever. Besides, it’d probably be A LOT easier on you AND your BFF (AND your crush!) if you started liking a guy your BFF doesn’t like! Have you ever done something terrible to your BFF? Did you confess? How did you make it right? Tell us in the comments! I fight with my bff 4 times a week! But this is not like that! I hope you get through this! Good luck! My friend and I get in fights with my bff all the time and get over it the next day. I suggest not thinking about it and when the conversation comes up change the subject.My friend and I have a lot of fun when I do the same thing. So just don’t talk about it. Plus all you need to do is dork it!!!! LOL Hope you get over it. Me and my bff fight all the time! Like, every single day. We always end up forgiving each other and being friends again. I really don’t like the fighting and when I try to tell her that, she thinks I want to fight and start an argument. She’s a really awesome friend and I never want to stop being her friend!! Its really hard now a days to go through a day without arguing. Anyway to make this stop so we can be happy and move on? Please help!!!! Talk to her! Or an adult. You can sort things out. I think that you should tell her that you guys should take a break for a while and talk about it!!! If she tries to argue back then you guys should NOT be friends anymore becuase that’s not what a good friend does!!! The thing is are you mad at her now? if you aren’t then maybe you could be friends with her. If your still are then you can tell her that it is ok to be mad at you but not ok to fight you. Talk to your BFF about it! Or an adult. You can always say sorry or say you don’t wanna fight. Don’t fight back! Tell a teacher and don’t talk to her! I would avoid that women. If she’s so annoying she isn’t you’re friend. Well, it’s definitely not a good idea to fight her. (1) You can get into BIG trouble. Besides, if she does really mean it, tell someone. However, if she is bothering you, don’t be afaid to tell her, firmly but don’t be mean, to stop. If she continues to bother you, tell someone, like a teacher/parent/trusted adult, and they can help you! My best friend was mad at me , and after she was done, she asked if I would still be her friend. I know she will not stay mad at you forever. I think you’ll do fine apologizing! Just say i’m sorry. And to the boy say: I was rong, there is this other girl that’s sweet, kind, and funny that likes you more, you should go out with her. But if this makes you to sad than do”;t do it!!! Does your BFF Still want yo be your your friend? My friend told her friend to guess her crush and he got it right. My friend told him not to blab it out but he told his friend and he told practically the whole school now. I feel so bad, she was crying! What should I do? My friend asked her friend to guess her crush and he got it right, then he blabbed our to practically the whole school! I feel so bad for her, she was crying! What should I do? I know how you feel. I like this boy that happens to be my BFFs friend and I think that he likes her, she is the prettiest girl in my year. Also I am sometimes a traitor. You should’ve thought about what you were going to say first. Don’t feel bad, people make mistakes. You should just explain to her that you didn’t mean to say it. Don’t worry because you sound like a kind friend an a really nice girl that doesn’t often do things like that usually. It’s good that you feel bad because it shows howw much you care about her. Don’t make that mistake again. I didn’t really do that to my BFF cuz our school didn’t have that kind of ✰dance✰ . Sounds tough! Good advice Nikki! know what to do because I really want to be good with her. I feel bad about the whole thing and feel like an idiot. What you did was a little mean, but you’re trying to make it right so hopefully your BFF will understand.Also you can’t help liking him, The Heart wants what wants! 🙂 Hoping you and your BFF the best! I told my bestie’s thing’s to a lot of people but she still keeps on #1. I have done something like that I have told my BFFs crush that she liked him and she hated me at first and giving me the silent treatment but we sorted it all out and now we are BFFLs Best.Friends. For. Life.